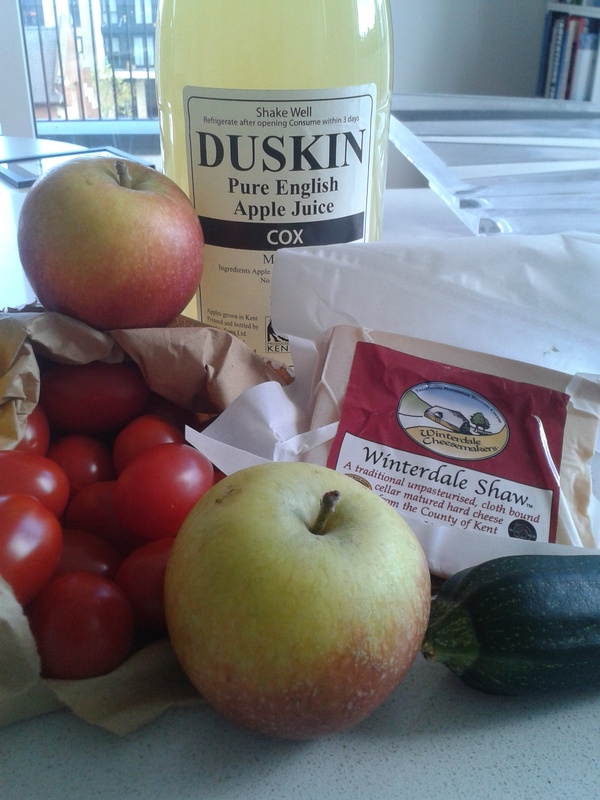 Lovely local produce. The contents of my shopping bag from my visit to Mike’s van today. I had a brief chat with Mike The Very Green Grocer today. Do you know him? You may have seen Mike and his missus at the Royal Woolwich Arsenal; they’re there every Saturday morning selling fantastic fresh produce from their van. Mike works hard and is very passionate about good food. He sources fruit, vegetables, cheese, juices, condiments and all sorts of other goodies from farms and other independent producers all over Kent and nearby. He grew up around Woolwich and has seen the place change over the years. He remembers shopping trips with his mum and dad, when Woolwich was a thriving hub filled with quality stores and a buzzing market. Mike told me that he and a group of likeminded locals have a dream of setting up a permanent market somewhere in Woolwich. They all make delicious things. Bread, preserves, pasta, condiments, and more. They live and work in the neighbourhood. Some sell their wares on the farmers’ market circuit and others have online stores. They’re all as keen as Mike (and mustard) to bring high quality, locally-grown and -produced goods to the people of SE18. Such a market would be firmly in the Things That Are Good For Woolwich category. Obviously. The Carbuncular Tesco Monster is sucking the life out of poor old Sainos. Marks and Spencers has buggered off after 100 years. Another American fast-food chain, Dunkin Donuts, has decided to experiment on the denizens of Powis Street, 40 years after McDonald’s flipped its first burger on English soil. Betting shops and pound stores abound. I think we deserve better, don’t you? So, let’s all get behind Mike and his mates and put some real pressure on Greenwich Council to help these talented folks find a venue in SE18. The now-vacant Marks and Spencers store? The old covered market? Get in the ear of any councillor you can pin down. Start a petition. Write, phone, tweet the council. Keep a look out for possible venues. Share this post, share your ideas. Let’s make this happen, Woolwich. I am a police officer dedicated to policing Woolwich Riverside ward. I am looking at different ways to engage more widely with the local community and I thought that you/your website might be able to assist me. I was wondering about posting on your website from time to time or possibly writing a monthly blog of my local activity in the community, what has been happening crime wise etc for your website? We could trial it initially and see how you felt about it. It would be really great if people such as yourself and people posting to your website responded to any posts I made with their concerns, questions etc. The blog would be personally written by me or someone else in the Woolwich Riverside team so it would be completely ‘hyper-local.’ I have noticed that some hyper-local websites in the area have links to the corporate Greenwich Police webpage but I want to write something much more tailored and meaningful to the local community. Alternatively, if you have any other ideas of ways I could engage this way through other hyper-local websites/blogs or utilising the Greenwich Police Twitter Account I would love to hear them. Hi Domenico, great to hear from you. That sounds like a great idea! Can you please email me on juliedillon67@gmail.com and let’s think of the best way forward. Cheers!